Kavalan Sherry Oak is the Kavalan Solist Sherry (57.8% alcohol volume) diluted to 46% alcohol volume with Kavalan spring water. Why, I hear you ask, should you not buy the Kavalan Solist Sherry and dilute it yourself? The simple answer is that the alcohol volume of 46% works wonders on the palate, neither overwhelming nor underwhelming the taste buds with alcohol while at the same time maximizing flavour. Diluting a whisky to an exact alcohol volume is no easy task, unless of course you can be bothered painstakingly measuring your dram with an alcometer. Aint no one got time for that! Kavalan have therefore done the work for you, and this beauty is ready to drink at a delightful 46% alcohol volume which makes it easier for the taste buds to savour its delights without numbing them with too much alcohol. Being aged in the warm sub-tropical climate of Taiwan, this whisky has benefited from accelerated maturation because in warm climates the pores in oak tend to expand more than in colder climates and this means oak casks “treat” more whisky, more quickly, in places like Taiwan (as opposed to cold places, such as Scotland) because the whisky has more interaction with the oak. The difficulty is that sometimes, with excessive wood contact, a whisky can taste woody and not really “mature”. The magic of Kavalan’s sherry oak expression, at least in my view, stems from the unique way it radiates the aromas and flavours of sherry wood without a semblance of misplaced tannin or woodiness which means that it smells and tastes mature and not “woody”. With this expression, Kavalan have mastered balance because the wood flavours this whisky has acquired sweltering in the warmth of Taiwan are expressive of the sherry rather than just the wood, and while the sherry influence is quite potent the whisky still glistens with barley. This is an absolutely breathtaking example of a “new world” whisky that masterfully projects an “over the top” but astonishingly balanced and integrated dry sherry bomb style for which I have fallen head over heels. The bouquet presents with mild shimmers of barley amidst powerful surges of dry sherry wood that shines with the classic nuttiness of Oloroso, cherries, chocolate, raspberries, ground coffee and hints of mint with sharp reduced balsamic. On the palate the whisky is much less dry than the nose suggests, but still delightfully medium-dry and true to classic Oloroso style. On the entry a soft sweetness coats the palate with glazed cherries, vanilla and baklava. At mid-palate the dryness intensifies, with a resurgence of the dryness on the nose with more intense wood notes and dark chocolate that leads to a drying finish with flickers of nuts and reduced balsamic but this time with a herbal hue that offers sweet mint. 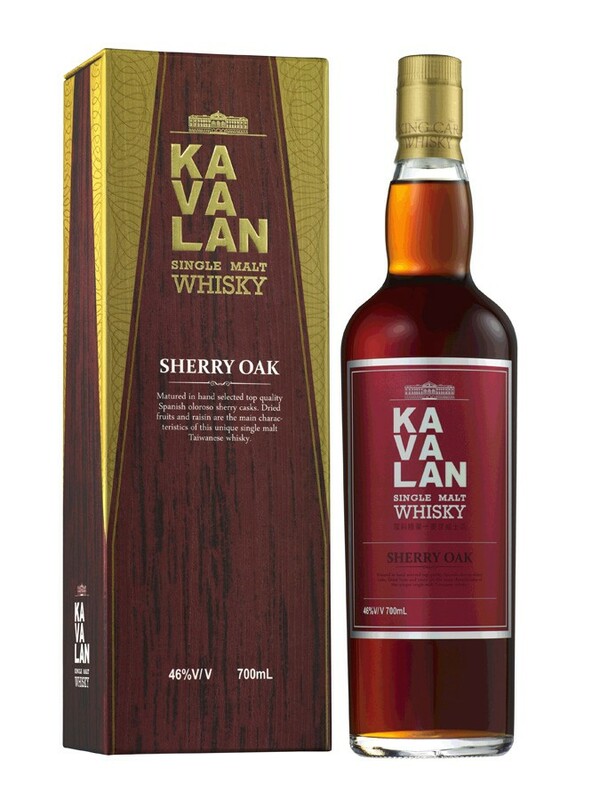 Overall, Kavalan sherry oak is a balanced, smooth, integrated, powerful, rich and flavoursome dry sherry bomb that projects hues of barley that glisten through the intricately woven oak notes. As you can probably tell, this is one of my favourite whiskies and in my opinion just as enjoyable (but in a different way) as the delectable – but much more expensive – Kavalan Sherry Fino. This entry was posted in Taiwanese whisky and tagged Kavalan, Kavalan Solist Sherry, Taiwan. Bookmark the permalink.